Haliotis diversicolor Reeve (Fam. Haliotidae). Zoological Name: 1. 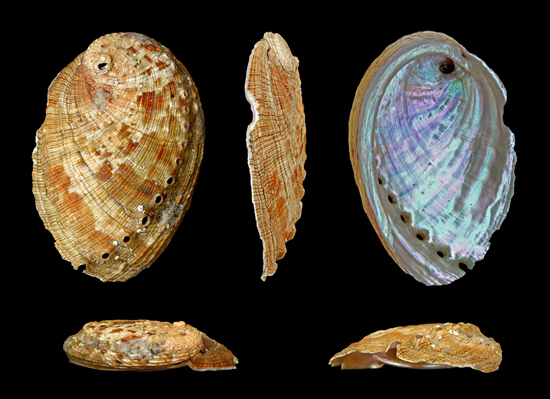 Haliotis diversicolor Reeve; 2. Haliotis discus hannai lno; 3. Haliotis ovina Gmelin; 4. Haliotis ruber (Leach); 5. Haliotis asinina L.; 6. Haliotis laevigata (Donovan) (Fam. Haliotidae). Common Name: Abalone shell, Sea-ear shell, Haliotis shell. Concha Haliotidis is produced chiefly in Guangdong and Fujian. It is captured in summer and autumn, dried in sunlight after being cleaned, and used unprepared or calcined. Functions: 1. To pacify the liver and subdue yang; 2. To clear the fire in the liver and brighten the eyes. 1. Deficient yin of the liver and kidneys and hyperactivity of liver yang: a) dizziness, vertigo and blurred vision manifestations Sea-ear shell (Shijueming) is used with Oyster shell (Muli), White peony root (Baishao) and Tortoise plastron (Guiban) to nourish yin and subdue yang; b) distending sensation of the head and eyes, headache, eye pain and red face manifestations Sea-ear shell (Shijueming) is used with Uncaria stem (Gouteng), Chrysanthemum flower (Juhua) and Prunella spike (Xiakucao) to pacify the liver and clear heat. 2. Flaring up of liver fire manifested as red, swollen and painful eyes and blurred vision. Sea-ear shell (Shijueming) is used with Chrysanthemum flower (Juhua) and Cassia seed (Juemingzi). 3. Deficiency of liver blood manifested as chronic blurred vision and dryness of the eyes. Sea-ear shell (Shijueming) is used with Prepared rehmannia root (Shudihuang) in the formula Shijueming Wan. Dosage: 15-30 g, decocted in water before other ingredients.